We can 'know the season, but not the day or the hour', meaning we are only given a general time frame for End of the Age events. (Matthew 24:32-36). During the great plague of Europe (1348-1352), prophets said the end was at hand and that Christ would appear within 10 years. John Wesley said the end would come in 1836. Others suggested 1830 and 1847. Based on the text of Daniel 8:14, a New England farmer named William Miller expected Christ's return between March 21, 1843 and March 21, 1844. His followers (Millerites) pinpointed October 22, 1844. People sold their possessions and sat on a hill waiting. Charles Taze Russell, whose public Bible studies formed the foundation of the Watchtower Bible and Tract Society, said Christ had returned to earth in 1874 and would begin his visible reign in 1914. Jehovah's Witness literature later spoke of "the Creator's promise of a peaceful and secure new world before the generation that saw the events of 1914 passes away." More recently Edgar C. Whisenant, wrote 88 Reasons Why the Rapture Will Be in 1988. When Christ failed to return, he predicted the rapture for 1989. The one thing date setters have in common is a strong desire for Jesus' return. There isn't anything inherently evil in trying to discover the "when" of it. Danger arises though when specific dates come and go uneventfully, and believers are left disappointed, even discouraged. Worst case, some have their faith shaken. It also fuels the unholy fires of scoffers questioning, Where is Christ's return? another sign of the times prophesied in 2 Peter 3:4. For further insight on timing, read J. Michael Hile's The Last Generation. Regarding the Rapture, there are those who claim it's a "new" concept set forth by John Darby in the 1800s. Blarney! They haven't done their homework and are simply parroting others on the Internet. It is often embraced by those who use scare tactics saying the WORST is coming so "buy my prep stuff, buy my gold". This is self-serving rubbish. Scripture is clear that gold and silver will be worthless (James 5:3). These are prudent interim measures, but they won't save your bacon long-term. Pease see Setting the Record Straight on Rapture. This is the 'Blessed Hope'  not to be confused with the Second Coming. One is a secret event, the other will be witnessed by every person on the planet. The Blessed Hope is not Christ's promised returned so it can not be referred to as a 'hope'. To do so is to doubt God's word. Since His word is truth it is a done deal. So the 'hope' must refer to something else  The Rapture... let him with ears to hear... The Blessed Hope is the event that Christians hope and believe will let them escape Tribulation. 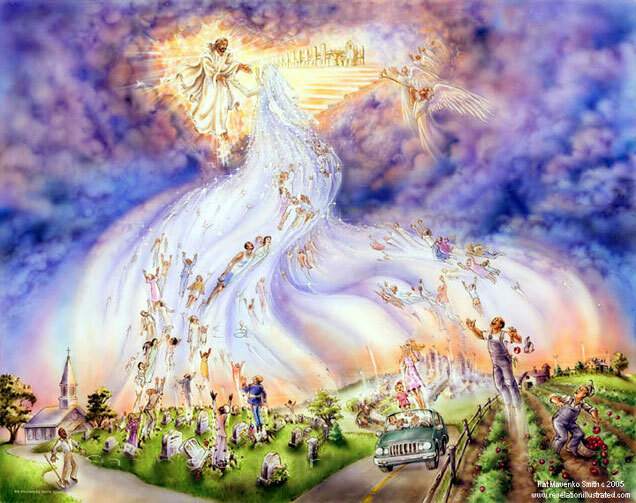 In Greek, the word ek, which means 'to be kept from' or 'to be kept out of',' and it is to Rapture that ek is applied. No one knows when Rapture occurs though the 'season' indicates it is likely within the next two decades  or it may be tomorrow. A lot of unpleasantness will transpire between now and then. This is why Stan and I continue to be prepare physically, spiritually, mentally. So be prudent, be prepared yet always 'looking up'. God's rapture of Church will be like a ''thief in the night". (1 Thessalonians 5:2). Pray you are found worthy. Americans, broad stroke, really don't give a rip what happens elsewhere. Not really, if we're honest. As a Nation, we are ego-centric. Case in point: When living in Australia, it felt like being a kid with her nose pressed against the window, watching world events from afar. Everything worthwhile happens in America, yes? Not so, though the majority of Americans believe this. With such a narrow world vision, many Biblical signs of the times will be missed. The world 'as is' will not go on ad infinitum. You must keep an eye on global events or risking being caught unaware and unprepared. You will know firsthand what it means that "men's hearts will fail" (Luke 21:25-26) because they were scared spitless at unfolding events. Daily current events show the world is unstable on many fronts. It is the reason why we post so many articles concerning Israel and the Middle East. If you rely only on American newspapers, only pay attention to U.S. news you will miss out greatly. There is a world beyond America. Israel is God's timepiece, His prophetic clock. Those familiar with Bible prophecy know that the final countdown began when Israel once again became a Nation. This occurred May 1948 and the clock began ticking. Scripture says that that generation  the ones alive when Israel's statehood was re-established  will see the End of the Age. News reveals a continuous up tick in world unrest, ramped up terrorism, declining financial stability and increased market volatility, a one world government taking shape, technology in place to number and track people, individual rights snuffed, and weather out of control globally. These things and many other indicators are given in the Bible as prophetic markers to watch. When these events escalate and more government participation is needed, it will be less able to give aid. Government is broke and people will be left to dig out of whatever crisis alone. If you thought government response to Hurricane Katrina was a giant screw up, a flaming fiasco, just wait. As we near 2012, you can bet there will be many who try to pinpoint Christ's return. If these dates fly by without note, be encouraged. Look at current events in context of these Signs of the End of the Age. Watch John Hagee interviewed by Glenn Beck - Bible Prophecies, Part 1 of 7, Part 2, Part 3, Part 4, Part 5, Part 6, Part 7. You'll know that the time is near and miracles are coming. Maranatha!